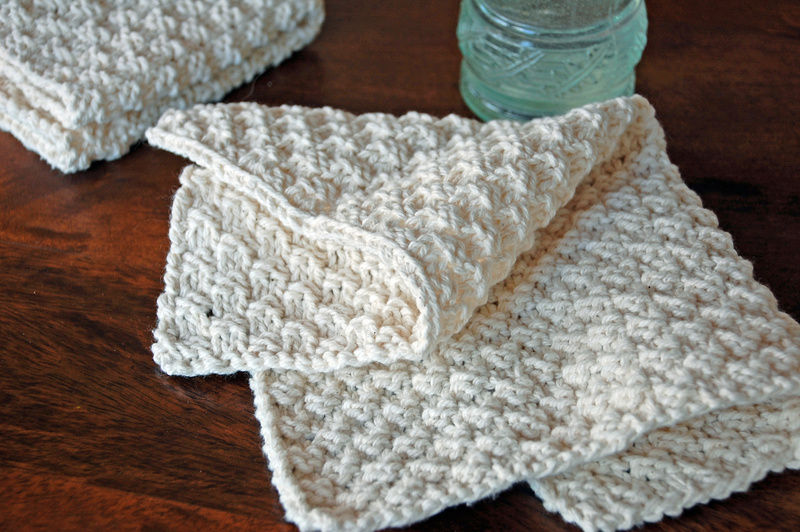 Are you ready for a for a Knit Cotton Washcloth pattern? 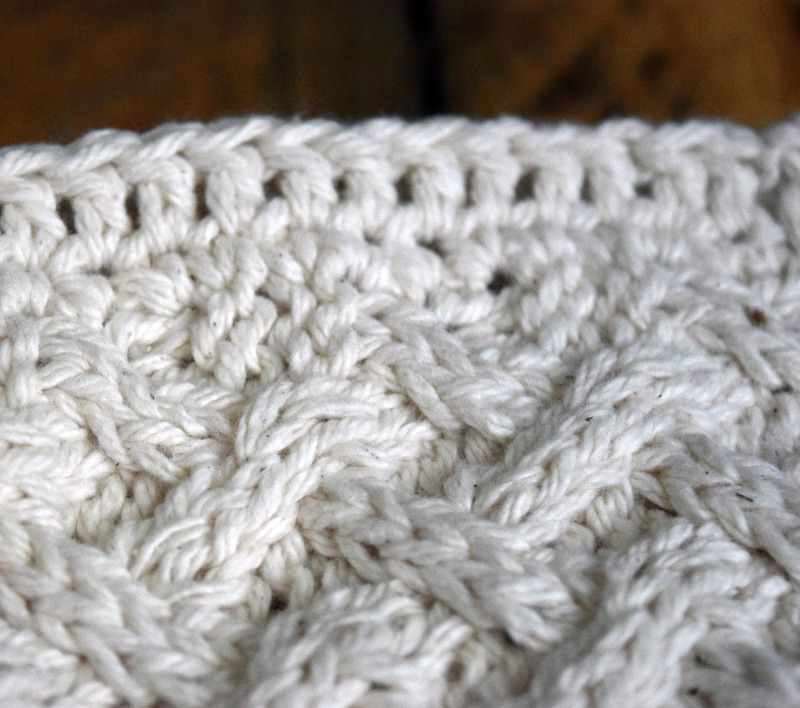 This one uses the lattice cable stitch has a lovely crochet edge to give it a little something special. If washcloths are on your list too, you are in luck today! I'm still entertaining myself knitting and crocheting washcloths for myself and for gifts. 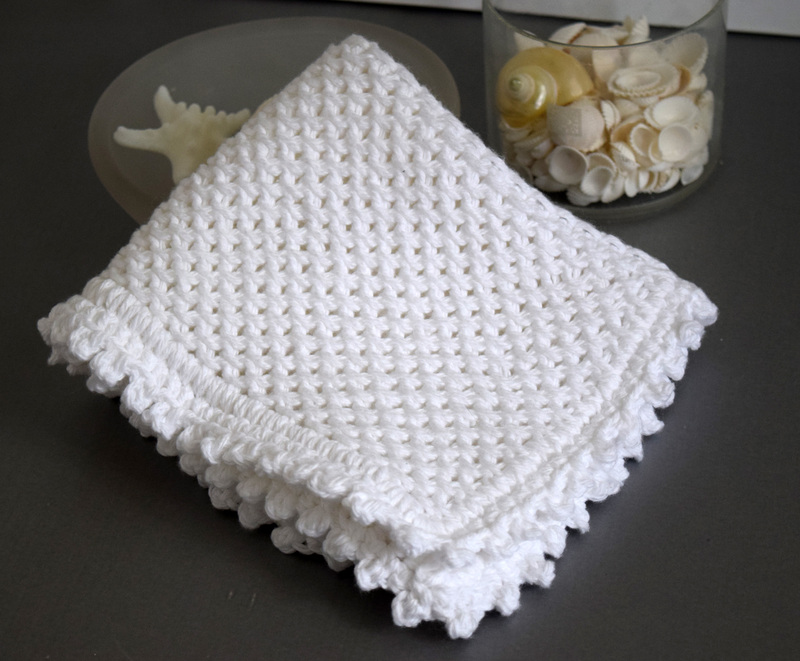 I especially enjoy knit cotton washcloth patterns with crochet edge. I get bored doing the same ones over and over, so I keep trying out new knit cotton washcloth patterns. For this pattern, I knit the Woven Lattice Cable Stitch for the base of the washcloth and a simple double crochet edge. Some of these are affiliate links and I will earn a small commission off of the sale of these products, but the price you are charged is not affected. For my full disclosure policy, see here. 2nd row(WS): K3, p4, *k2, p4; rep from * to last st, k1. 3rd row: P1, C4F, *p2, C4F; rep from * to last 3 sts, p3. 4th row: Rep Row 2. 5th row: P3, *k2, T4B; rep from * to last 5 sts, k4, p1. 6th row: K1, p4, *k2, p4; rep from * to last 3 sts, k3. 7th row: P3, C4B, * p2, C4B; rep from * to last st, p1. 8th row: Rep Row 6. Repeat rows 2-9 7 times, or until desired height. C4B – Cable 4 Back. Slip next 2 sts onto a cable needle and hold at back of work, knit next 2 sts from left-hand needle, then knit sts from cable needle. C4F – Cable 4 Front or Forward. Slip next 2 sts onto a cable needle and hold at front of work, knit 2 sts from left-hand needle, then knit sts from cable needle. T4B – Twist 4 Back-.Slip next 2 sts onto cable needle and hold at back of work, knit next 2 sts from left-hand needle, then purl the 2 sts from cable needle. T4F – Twist 4 Front. Slip next 2 sts onto cable needle and hold at front of work, purl next 2 sts from left-hpnd needle, then knit sts from cable needle. These really do knit up quickly and make great gifts. The crochet edge really finishes the knit cotton washcloth nicely. If you're doing any travel this summer, knitting these will help you occupy your time and be productive at the same time. These washcloths really knit up pretty quickly. If you get started, you could make quite a gift stash for the holidays! 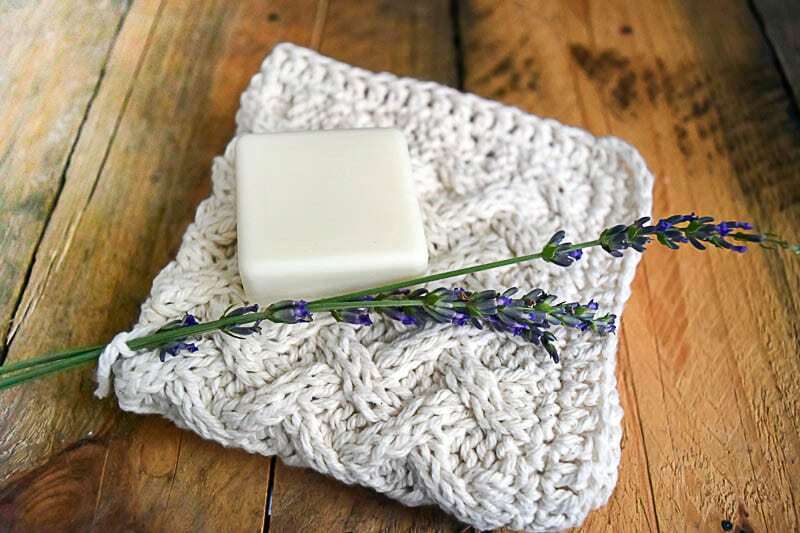 Here's a round-up of some great items to accompany your knit cotton washcloth if you're looking to gift them. These are affiliate links and I will earn a small commission off of the sale of these products, but the price you are charged is not affected. For my full disclosure policy, see here. However you decide to ‘gift' your washcloths, I know the recipient will be thrilled. Pin the following image so that you can refer back to this page the next time you want to make a knit cotton washcloth. I never knew that we shared a love of washcloths! I am loving these patterns…but I’m still crochet challenged! BTW, Frankie loves washcloths, too! Love them! soo pretty! I’m embarking on my first washcloth now as my little on loves them so I’m making one in her favourite colour, Blue! Thanks Vicki…enjoy your knitting project. I have several other patterns that you might want to try as well, https://www.nourishandnestle.com/knot-another-washcloth/ and https://www.nourishandnestle.com/hand-knit-washcloths/. They are both listed under the Create section of my blog. Thanks for stopping by! Hi Kellie, enjoy your knitting!Its a fun hobby and these washcloths are quick, gratifying projects. Thanks Ruthie! I’d love for you to come visit very often. It makes my heart happy to know that I have kindred spirits out there who find my site useful and enjoyable. Thanks again for the kind comments. knits, especially washcloths, I think knitting the cable spa cloth will be an experience, hopefully a good one. I hope so too Lin. Do let me know if you have any questions! Good Morning Ilka…it all comes down to having the time, doesn’t it?! I know how that is. I’d love to make some more too…but just haven’t had the time lately. So glad to see you’re posting more gluten free recipes! My daughter and I will hopefully get a lot of baking in this weekend. What beautiful wash cloths! Just love the neutral color and textures on them. I find that I have to concentrate too hard when I knit, so have been wanting to make some washcloths using crochet. 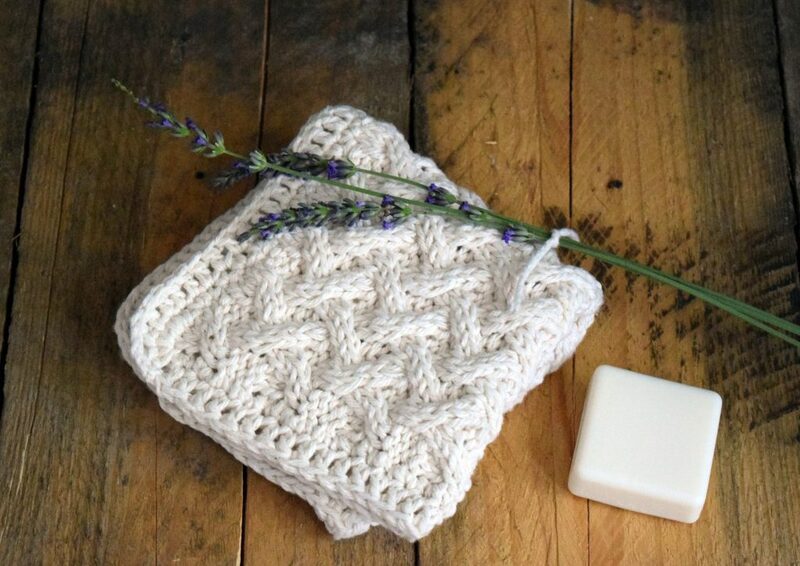 Do you have any patterns or tutorials for crocheted washcloths? Hi Lori…so sorry this comment got lost and I didn’t get back to you sooner. Sadly, I only have knit dishcloths, though I do add crochet borders to many of mine. I am relatively new to crochet, but guess I need to up my game and figure out some crochet dishcloth patterns. Thanks for prompting me.